It's sort of a good news and bad news today. The motherboard on our machine finally cack'd and we're moving into a new machine (the new iMac), which is kind of like moving IRL and a pain in the posterior. 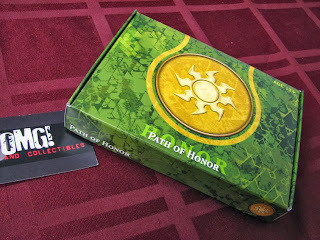 Given this, we'll rise from the ashes in the next few days or so, which is also when we'll have a ring at our door from the courier delivering a box of awesome new Theros singles from MTG Mint Card. 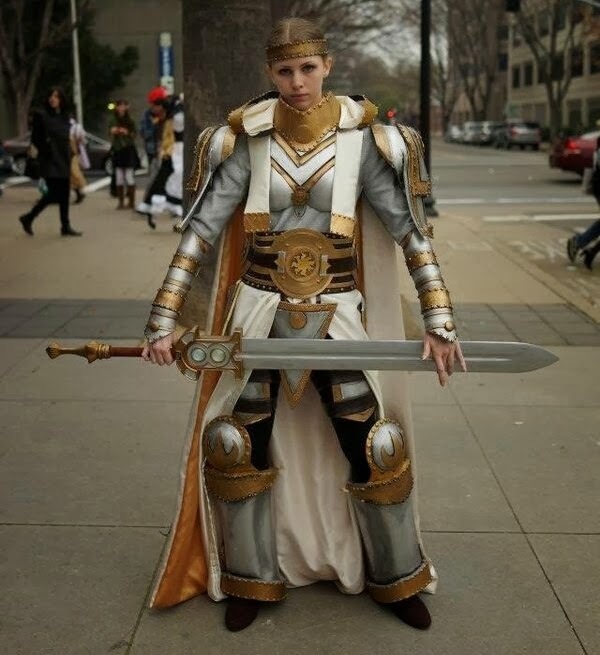 Anywhoos - for today's post - some news which will make CosPlay fans happy. 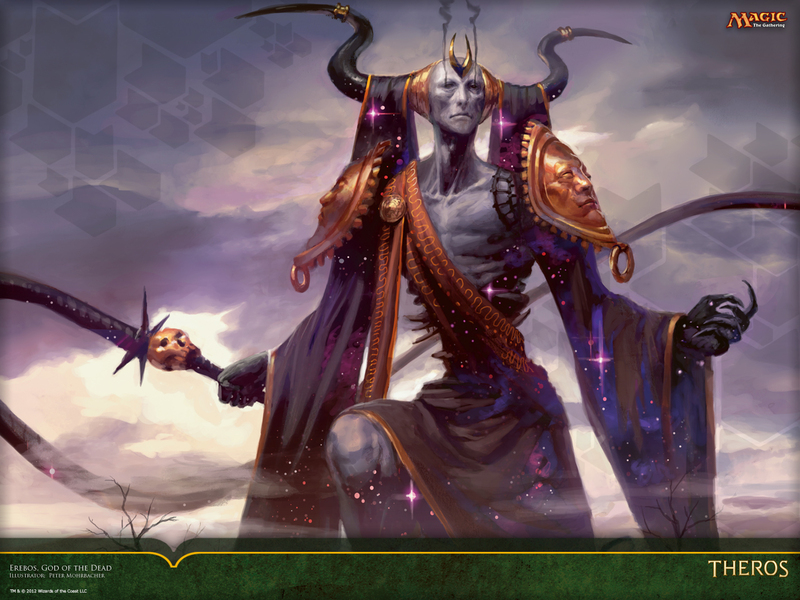 Wizards has wrapped up their 'Ignite Your Spark Contest', which challenged fans to submit a photo of themselves auditioning to become the Planeswalker of their choice. 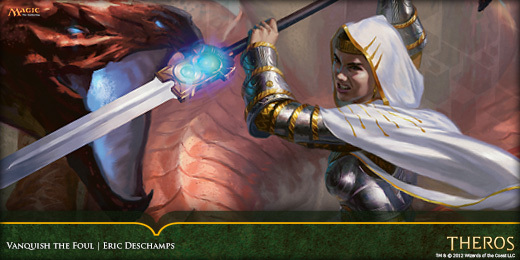 Contestants could choose any of the following Planeswalkers: Ajani Goldmane, Chandra Nalaar, Elspeth Tirel, Garruk Wildspeaker, Gideon Jura, Jace Beleren, Karn, Koth of the Hammer, Liliana vess, Nicol Bolas, Nissa Revane, Ral Zarek, Sarkhan Vol, Sorin Markov, Tamiyo, Tezzeret, Tibalt, Venser, or Vraska. Felicia Day made the announcement over on the mothersite today . 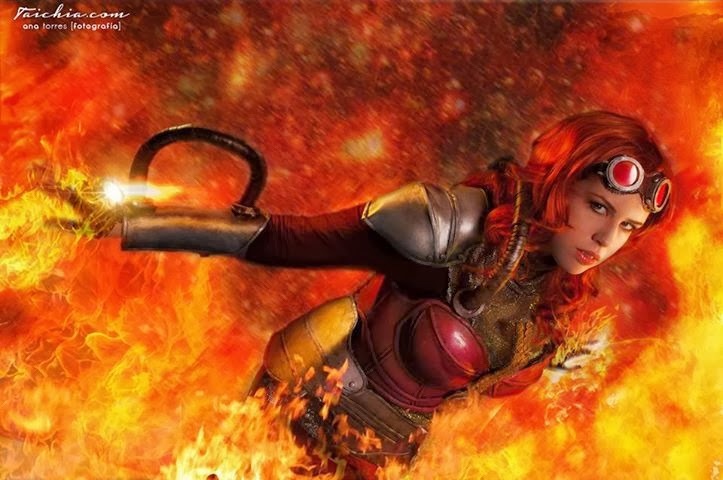 . .
Congratulations to Laura H. (Sumyuna Cosplay) from Madrid, Spain, on her winning Chandra cosplay! Laura will win a trip for two to a PAX of her choice in 2014! Unfortunately, we could not get out to Friday Night Magic at OMG! Games (here in Barrie, Ontario) last night and try out the brand new format as the motherboard in our computer died a horrible 'n' smelly death. 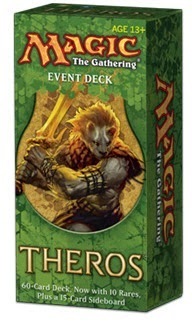 This of course means that the several new Magic: the Gathering videos we had wanted to get off for some of the new Theros products will unfortunately not happen until we're into a new computer. There's some very decent early drops in this build to obtain a board presence which when targeted provides a benefit. The added bonus of targeting your creature with one of those lovely auras can transform your unimposing creature into a real threat. 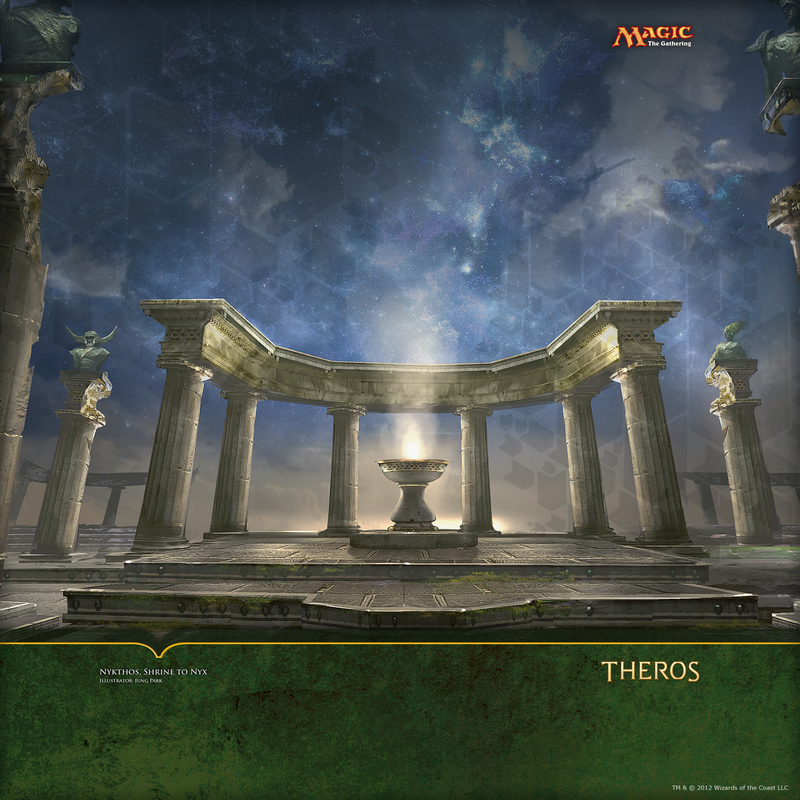 We think that this Theros pre-constructed Intro Deck not only can be the perfect start to get into the game for a newer player but also gives a very decent base on which to upgrade as you start acquiring new cards from your local games store on online MTG retailer like MTG Mint Card. 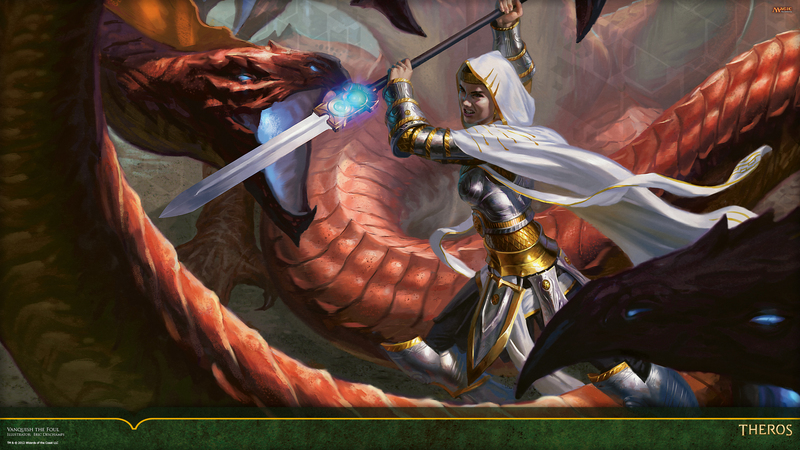 We simply cannot wait until our MTG Mint Card pre-orders are shipped so we can start brewing up builds and start gaming at OMG! Games (Barrie, Ontario) Friday Night Magic events. 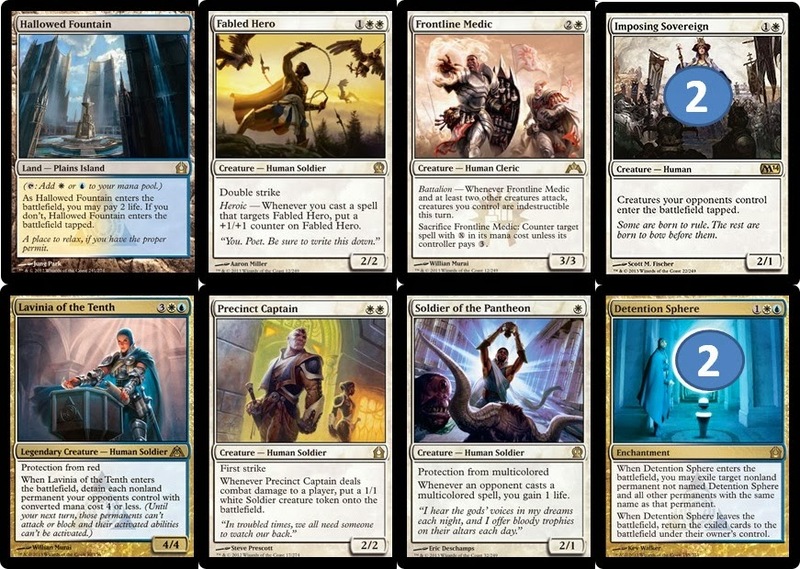 For this particular Friday, we'll likely stick to a Return to Ravnica block deck with a few singletons of Theros we've picked up from the PreRelease event. 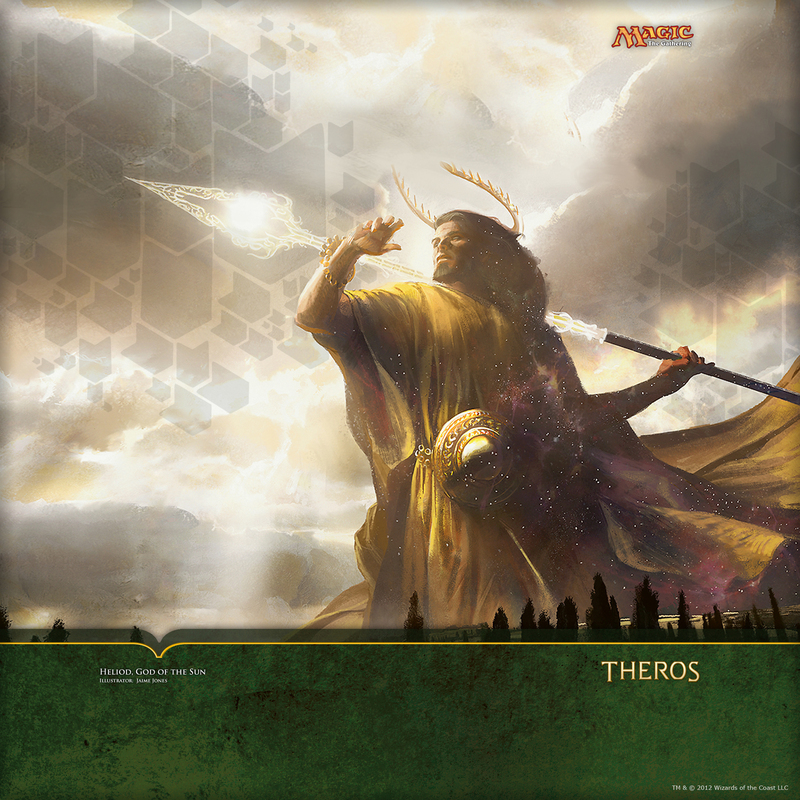 Speaking of events, Theros Game Day is scheduled for the weekend of October 19th / 20th and the Theros Event Deck will be going on sale that Friday giving gamers an opportunity to take it for a spin. 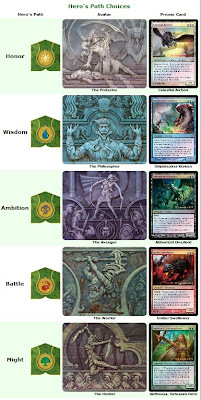 Unlike the preconstructed Intro Decks, which Wizards of the Coast develops with newer players to Magic in mind, event decks are built with with a focus given to tournament-play competitive players. 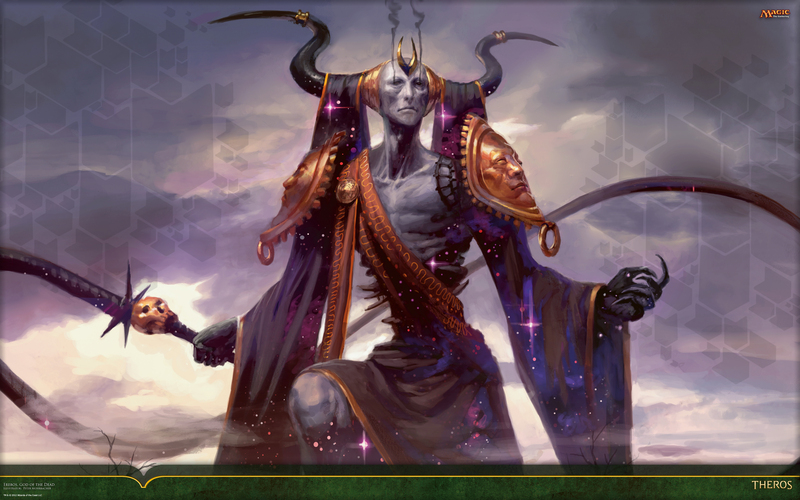 We now have the final decklist today over on the mothersite, so let's have a look. Anywhoos, for an MRSP of approximately $25 (depending upon where you may be), here's what you get . 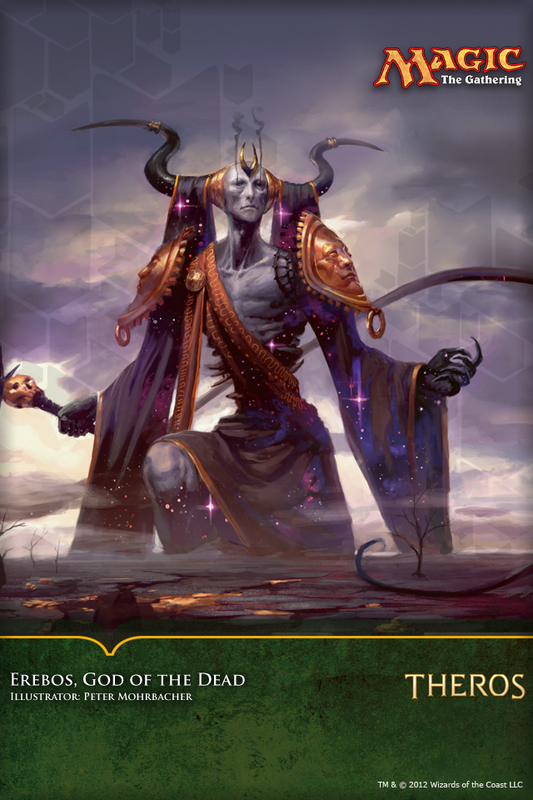 . .
We've been rather busy this week ripping apart our standard constructed decks and evaluating what can be saved going forward into the new standard environment. It's really not until the fall standard rotation that we have a sense of just how many Magic: the Gathering cards we've accumulated in the previous blocks. 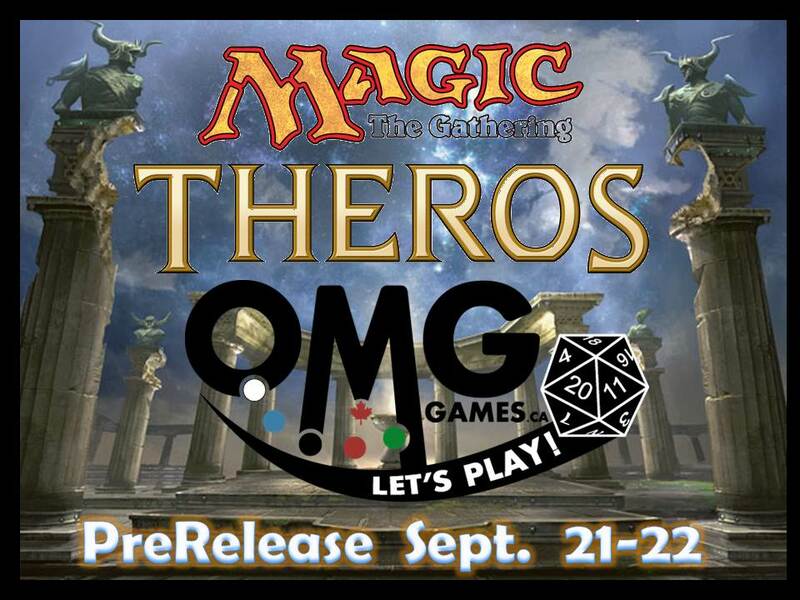 This Friday when Theros, the newest set is to officially released, we'll be at our favourite central Ontario gaming store, OMG! Games sporting new untried and untested strategies - perhaps Big Boros, Selesnya mid-range, Orzhov Control, or G/W/? enchantments. Our (fairly extensive) pre-order from MTG Mint Card will be shipping out on Friday and travel via courier some 12,600 km (~7,800 miles) and likely be at our front door on Monday or Tuesday the latest. 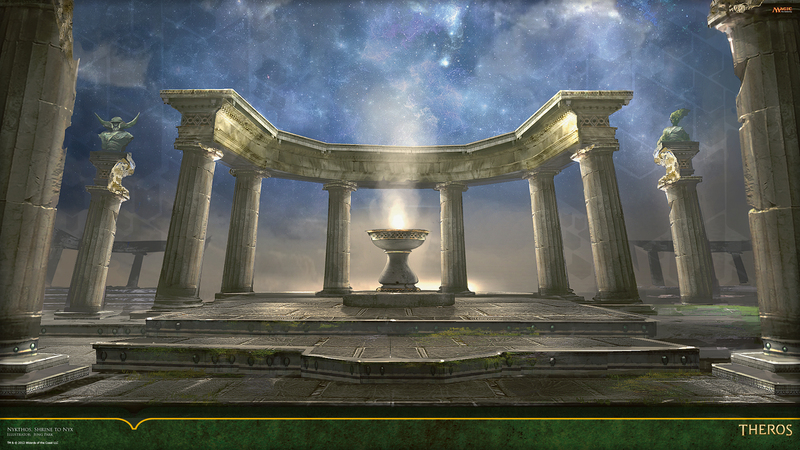 With cards in hand, we suspect we'll have a much more competitive build. 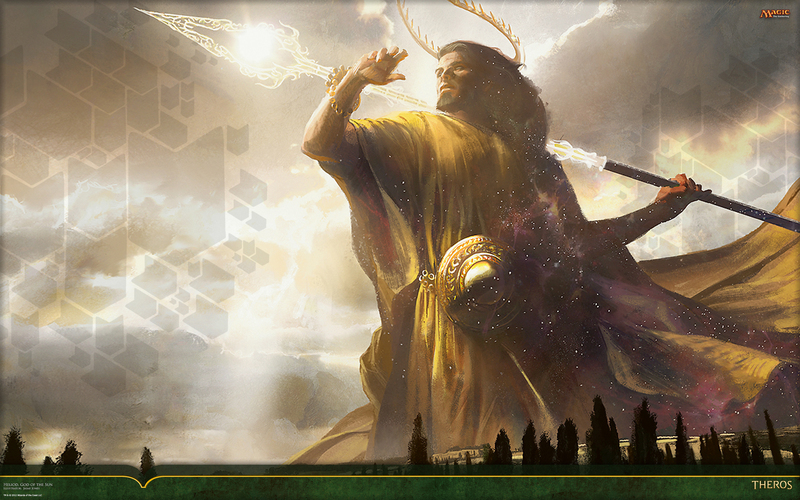 Anywhoos - for today, here's a few very lovely wallpapers featuring some the coolest Theros arts from the mothersite. 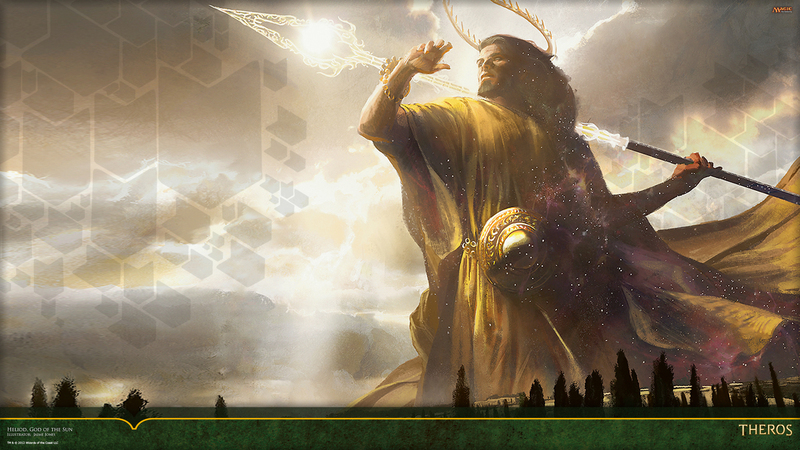 We trust that all had an amazing Theros PreRelease weekend. 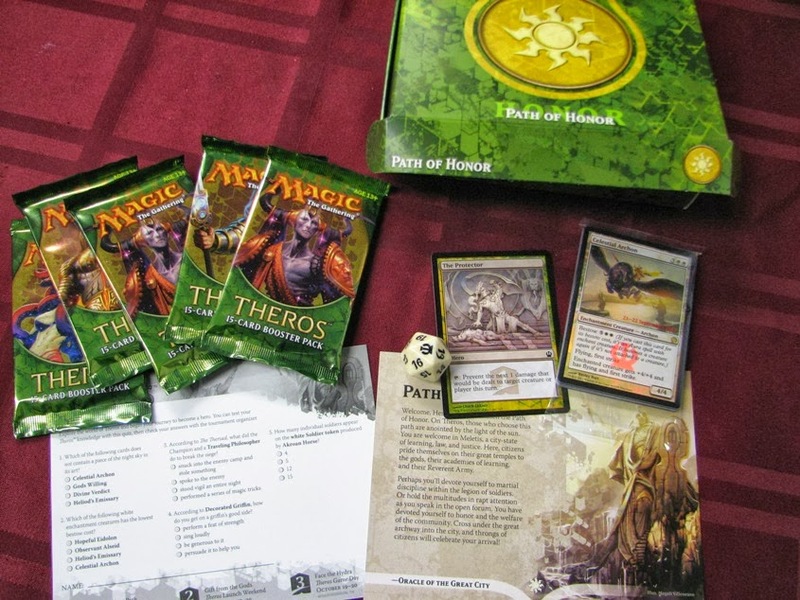 Here at MTG Realm, we attended the Friday midnight PreRelease event at OMG! Games in Barrie, Ontario where approximately 45 players gamed from just shortly after midnight to almost 5 in the morning. 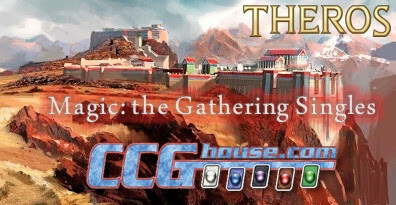 After that event, we most definitely wanted to get more of Theros sealed at the Satuday and Sunday events but unfortunately just could not make it due to some other things which popped up. That's OK we guess - that'll just mean some extra cash for some MTG singles at MTG Mint Card and to grab boosters when Theros officially releases this Friday the 27th. 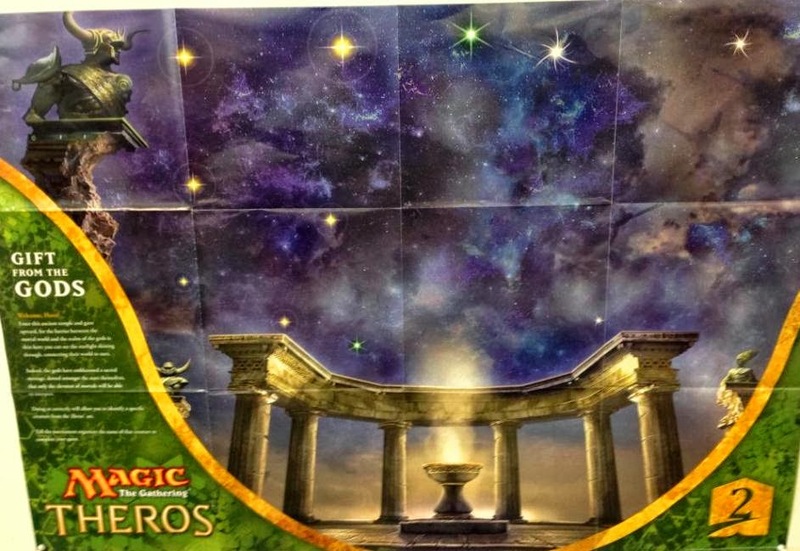 Speaking of which, we came across an image posted on the interwebs - that Gift from the Gods poster for the Theros Release which is actually a very clever puzzle from Wizards of the Coast. SPOILER ALERT ! - If you want to solve the poster puzzle for yourself, please do not read on. 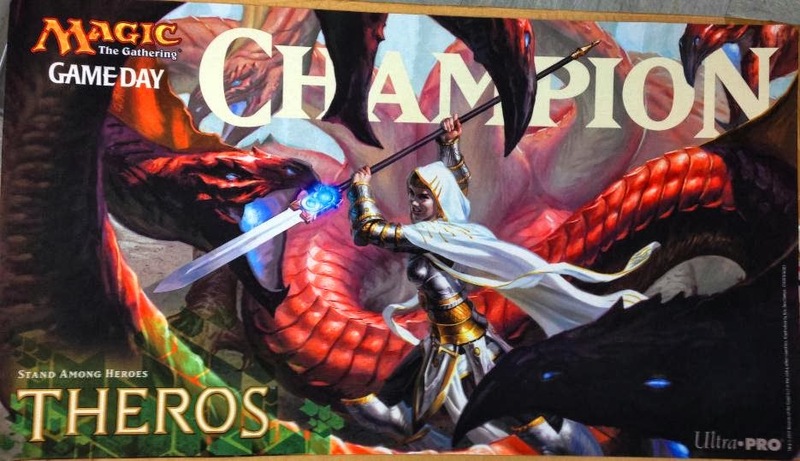 At Theros Release Weekend, which starts with Friday Night Magic that first evening, you’ll see a unique and mysterious poster emblazoned with the Hero’s Path symbol. This poster is a puzzle sent from the gods as a message to their chosen Hero. 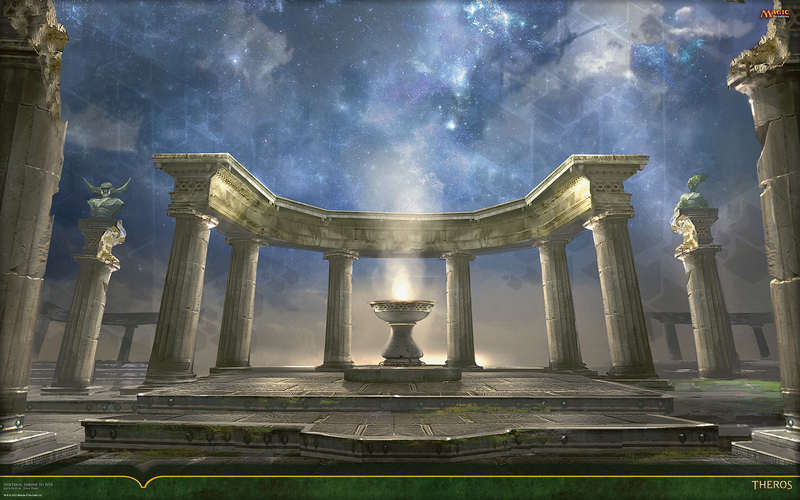 Enter this ancient temple and gaze upward, for the barrier between the mortal world and the realm of the gods is thin here: you can see the starlight shining through, connecting their worlds to ours. Indeed, the gods have emblazoned a sacred message, dotted amongst the stars themselves, that only the cleverest of mortals will be able to interpret. Doing so correctly will allow you to identify a specific creature from the Theros set. Given the poster image comparisons, we think it fairly clear that tracing the stars you get " 5 / 7 ". 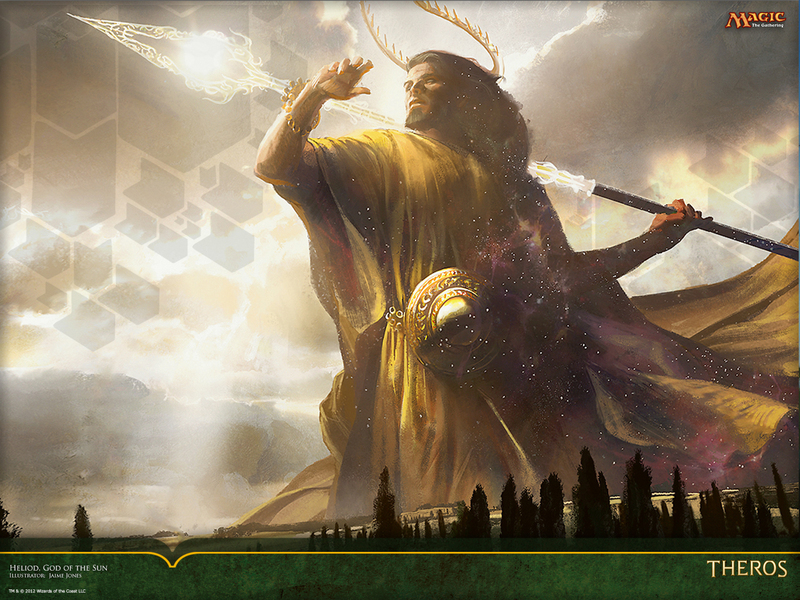 Oddly, there is only one Theros card with power / toughness stats with that. 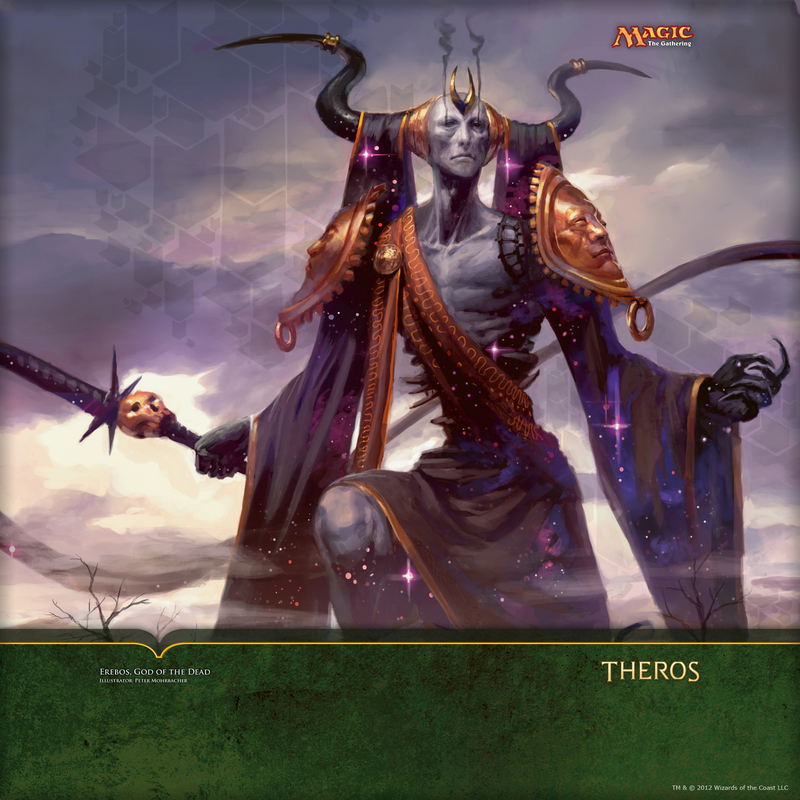 Yep - it's Erebos, God of the Dead - and given the flavor / storyline, we think this may be the antagonist pitted against the protagonist team of Heliod, God of the Sun and Elspeth, Sun's champion. 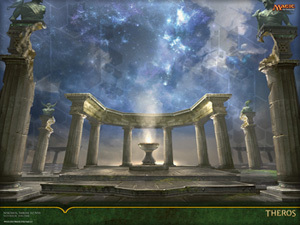 Next up - it appears someone had finally snapped and posted an image of the Game Day playmat. If you happen to place first at the Theros Game Day event on the weekend of 19th October, you can score this pretty slick playmat featuring art from the card Vanquish the Foul, illustrated by the amazing Eric Deschamps. 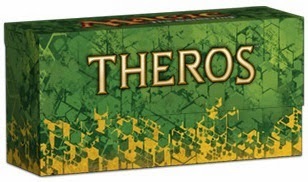 Magic: the Gathering players around the world are crammed into local game stores cracking packs of Theros, the latest set from Wizards of the Coast. 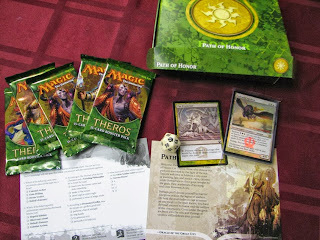 Here at MTG Realm we attended the midnight pre-release event at OMG! Games here in Barrie, Ontario, Canada-Land where a good crowd of about 45 gamers played from midnight to almost 5:00 am this morning. We were half expecting some of the players to come dressed in togas to get the full experience going with this ancient Greek mythology-themed set. Our MVP for the evening was Evangel of Heliod which drops 1/1 white soldier creature tokens commensurate with our devotion to white - and - more than once we also had the Spear of Heliod out to anthem 'em up. We performed not too badly going 2 wins 2 losses. The first loss we'll blame on silly game mistakes and the second loss down to draws and mana. All in all, a great time had. 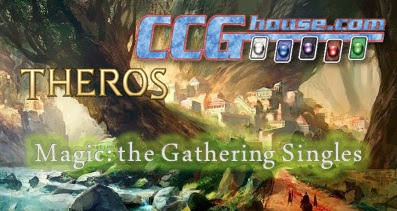 Magic: the Gathering fans are gearing up for the big Theros pre-release party this weekend and we think game stores are gonna be packed. 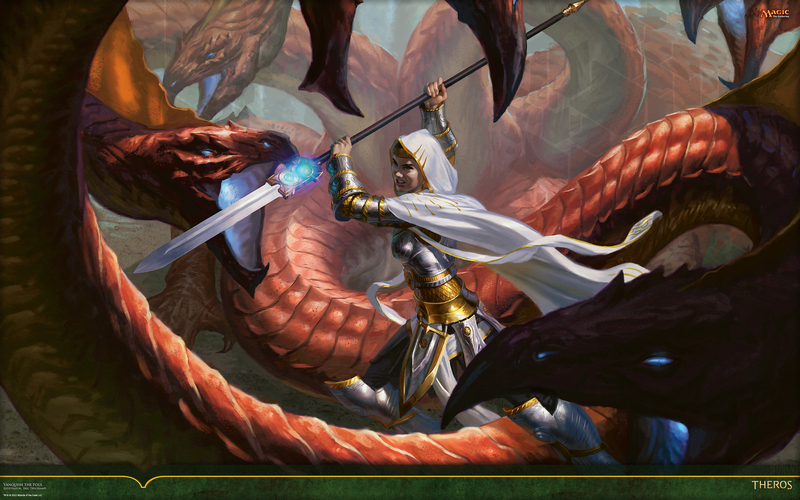 Tonight, we here at MTG Realm will likely be finalising our singles pre-order to MTG Mint Card, with Friday Night Magic tomorrow, and then two solid days of Theros PreRelease. We'll likely only be leaving OMG! Games & Collectibles here in Barrie, Ontario to shower and shave. 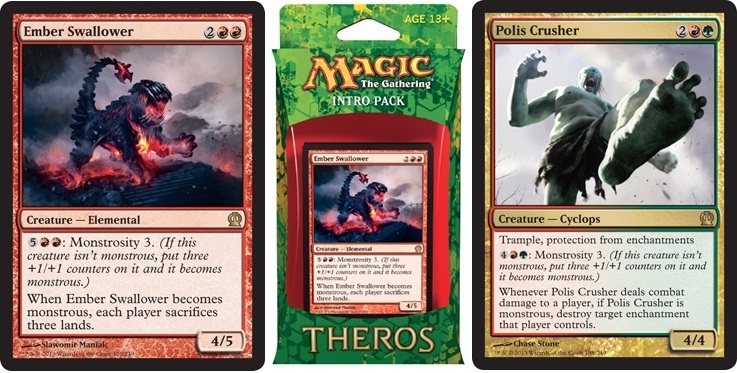 Some players we've talked to just cannot decide which Theros PreRelease pack to go with this weekend, while others want to play all the colors. If you are still sitting on the fence as to which color to go with, here's a set of videos from Derium'ss CCGs in Cuyahoga Falls, Ohio who has kindly presented a show 'n' tell of each - have a looky-loo. Give 'em some link love to their Facebook page and their Twitter y'awll. EDIT - 7:00 PM EST 9.19.2013 - It appears that the videos have been removed or set to private now. We suspect that Wizards may have directed correspondence to Derium. All the seed packs seem to follow a similar pattern - - Each has 11 commons (5 off-color, and 6 on-color, one of which was the same in both pre-release packs of each color). 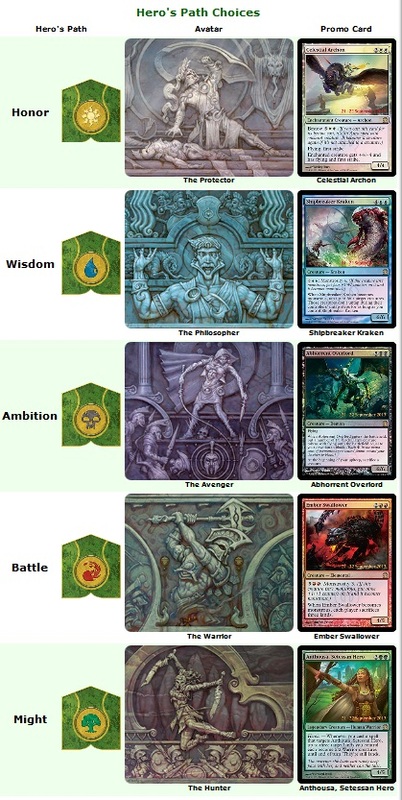 It has 3 uncommons. 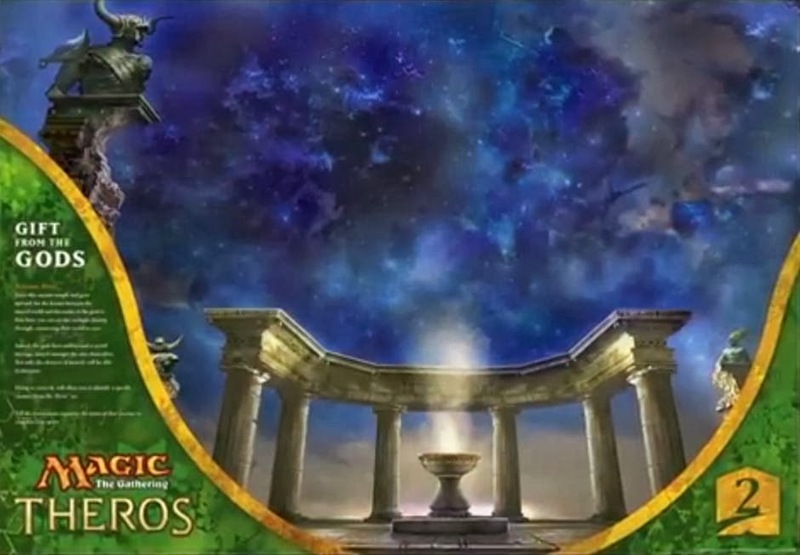 1 on-color, 1 off-color, and 1 of either a multicolor or off-color and 1 rare/mythic, which can be multicolor. 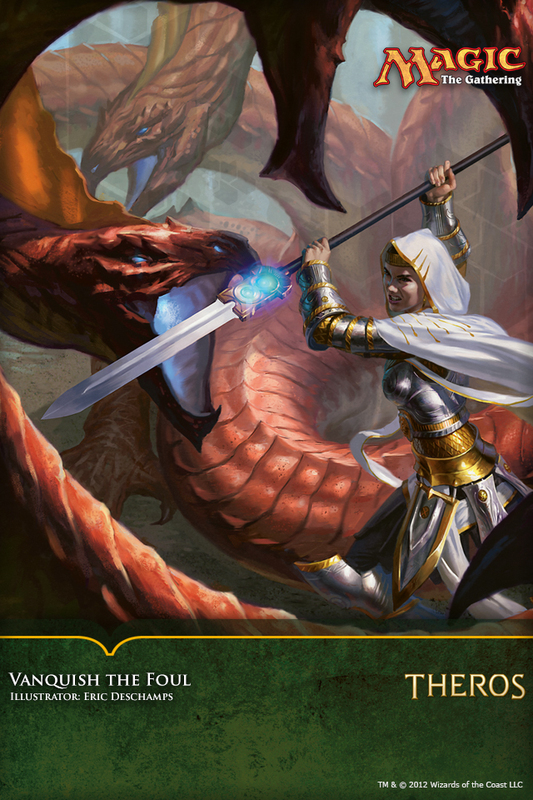 Just a an additional note - Each prerelease seed booster has a playable promo. It has a primary color but isn't monocolor. Can open a God but no other mythic. This weekend, Magic: the Gathering players will converge upon local gaming stores around the world to participate in the Theros PreRelease event. 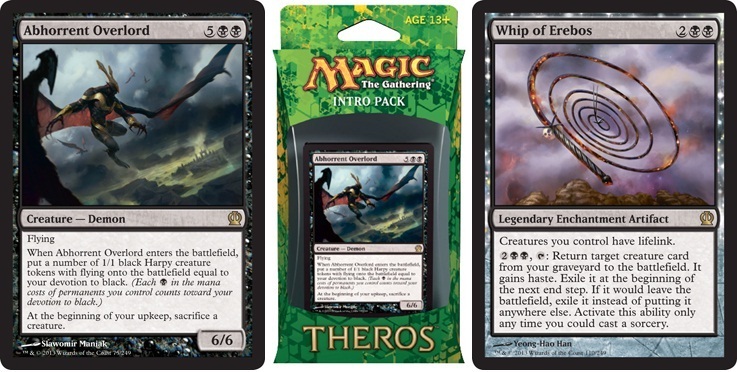 Similar to the Return to Ravnica block sets, gamers will have the opportunity to choose one of five Theros PreRelease packs which will contain just about everything you need for an amazing afternoon (or morning) of great gaming. A few players we know will be attending more than one event to collect additional PreRelease Promos, cards, and a chance to win prizes. Close to highway 400 and Georgian College. 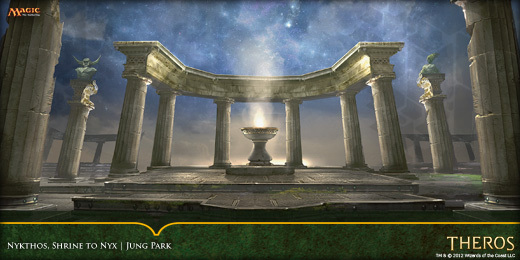 For these events, players may use the promo card included with the Prerelease Pack in their tournament deck. Two-Headed Giant — Each team Two Pre-release packs for constructing two decks with. Prizes given out based on attendance. Win against the Owners in swiss rounds and receive 2 additional prize packs. 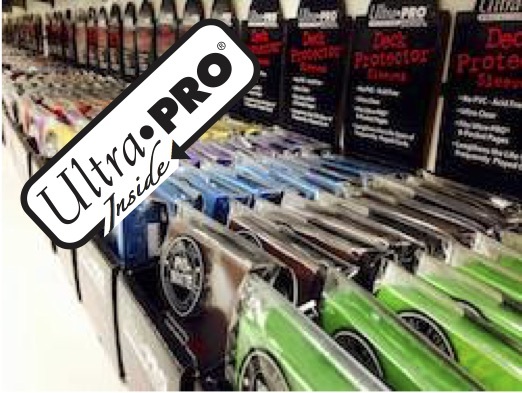 5 Pre-Release Special – $150 enters you in any five events. 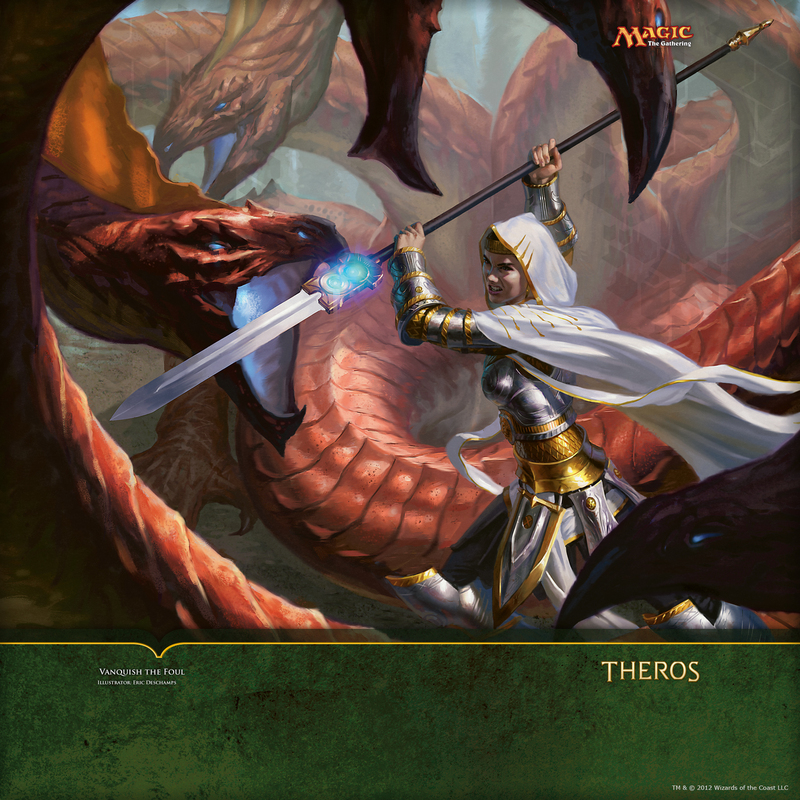 We have the entire Theros set now out in the open and Magic: the Gathering fans are downright giddy with excitement (us included) as we consider all the new cards soon available. 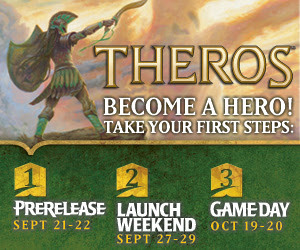 The prerelease event is this weekend (21st September), with the formal release the very following weekend (27th September). After your review and evaluation, make sure to get your singles pre-orders in to MTG Mint Card - we're still working out a few deck ideas but will have new standard decks ready very soon. 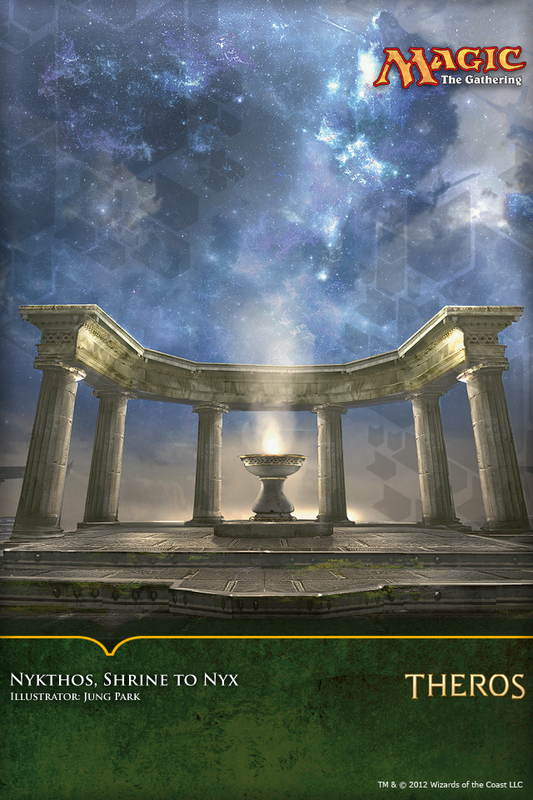 With the "Favors from Nyx" deck, bestow the gifts of the divine on your creatures, enhancing them with additional power and useful abilities. With the "Manipulative Monstrosities" deck, you can command colossal Krakens, gargantuan Giants, and the forces of nature itself to smash your opponent into submission. 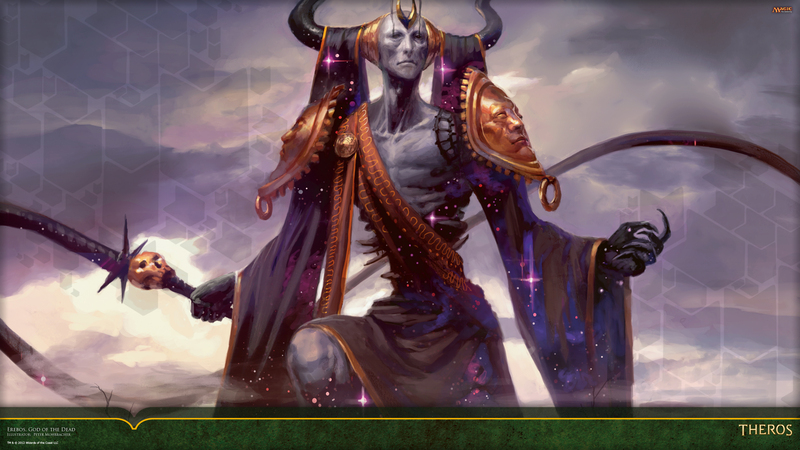 With the "Devotion to Darkness" deck, your primary goal is to assemble many black permanents to increase your devotion to black—the number of black mana symbols in the mana costs of permanents you control. Monstrous terrors encroach into the territories of Theros's proud civilizations, threatening to crush their great cities into dust. 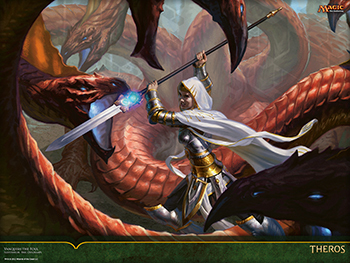 The "Blazing Beasts of Myth" deck puts them at your command. 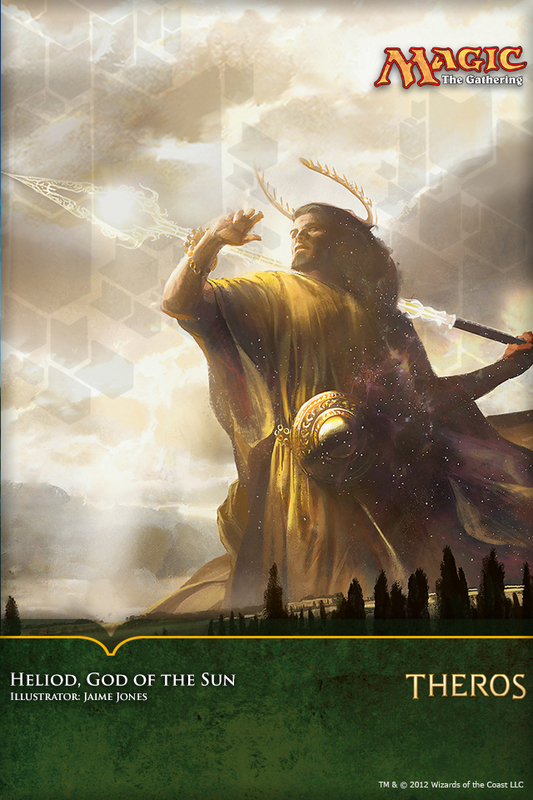 With the "Anthousa's Army" deck, use potent spells to help your heroes find their inner strength and defeat the enemy.